Great Britain #1, the worlds first postage stamp. On May 6, 1840 Great Britain created the first opportunity for anybody, anywhere on earth, to become a stamp collector. Thank you. 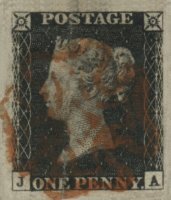 This stamp is by no means rare, but since many stamp collectors would like to have a copy of the world's first stamp, it is more expensive than its rarity suggests. Over 68 million copies were issued. France Scott #3 & 8, January 1, 1849. You may have thought that #1 would be the first but that is not always the case. As a matter of fact, Scott #3 and #8 were the first two stamps issued in France! The stamp shown, France Scott #8 (Yvert & Tellier #7) is quite rare and very expensive. Only about 300,000 copies were issued. In contrast, Scott #3 (Yvert & Tellier #3) was issued in over 41 million copies. Paraguay Scott #1 - 3, August 9, 1870. Paraguay's first stamp issue, and in particular Scott #1, is not really expensive, but they are difficult to find. Only about half of the #1's issued were actually used on mail, but the total quantity issued was a mere 20,000 copies! Yemen Scott #1 & 3, 1926. Little is known about the first stamps issued by Yemen. The exact issue date isn't even known, although these stamps were issued less than a hundred years ago. Scott #2 was issued after Scott #1 and #3. Can a country have more than one first issue? Of course! Argentina issued their first postage stamp on May 1, 1858 when it was a confederation. However, on January 11, 1862, they issued their first stamps after having become a republic. That 'second' issue can also be considered as a first issue! The fact that the Scott catalog identifies it as #5 is of no concern to first issue collectors. Another "country" which have blessed the first issues collectors with several "first issues" is Schleswig-Holstein. There are many more examples to be found on our site.